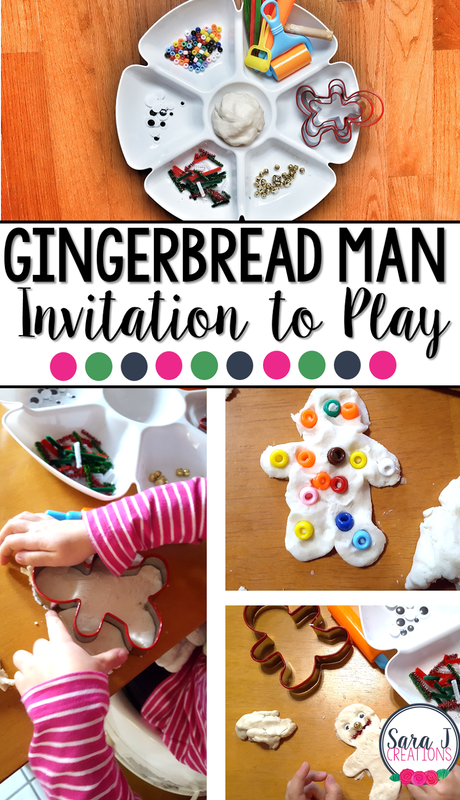 After the fun we've had reading different gingerbread books and practicing counting gingerbread men, I decided to do a gingerbread themed invitation to play. The girls liked our community helpers invitation to play once they accepted the fact that they could only play and create with what was in front of them - not all the playdough tools we usually get out or multiple colors of playdough. This time they were ready and didn't even ask for other items. I love that this is an open ended activity with no direction from me or right or wrong way to do it. Just supplies and an invitation to play with them. I used our favorite microwave playdough recipe but left out the Kool-Aid and added essential oils. I figure that would double as gingerbread type smell and also work to fight germs that come home from preschool with my daughter. Mix all the ingredients except the essential oil together and microwave for 50-60 seconds. Add essential oil, stir and let cool. Knead well and add more flour if needed. My 4 year old instantly said 'what am I going to use for the buttons and the clothes,' but without any prompting from me she grabbed jingle bells and used that instead. Love that activities like this are open ended but also challenge them to use what they have available. Little sister just worked on her fine motor skills and pushed pony beads into her gingerbread until he was covered. This was one of the first times we've used cookie cutters with play dough. They've used some cheap ones that come with their playdough tools but this was the first time they used a sturdy metal one so I showed them how to press down hard and then the extra dough will easily pull off. Another successful activity that didn't involve much prep and continued the gingerbread excitement!